Be the first to see new Pho.to Lab for Android! Finally! 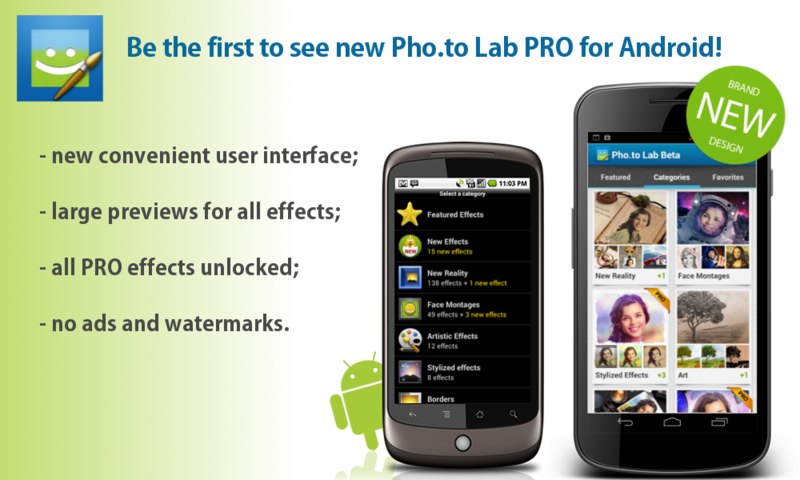 We are happy to announce the launch of brand-new Pho.to Lab for Android (beta version)! It’s not just another update, but a complete re-design of the application that comes with new winning and convenient user interface and recent groups of effects. We know we kept you waiting for quite a while and that’s why we feel like you deserve a chance to give a thorough try to the PRO version (which means all premium effects unlocked) of Pho.to Lab on your Android device free of charge. If you are reading this post, you must love taking photos. Do you know how to make your favorite shots stand out of the hundreds of pictures you have? You must have stumbled upon advice to use rule of thirds, diagonals or negative space. But mastering these techniques can take years. Do not worry, there is a special ingredient that can make any of your photos look outstanding. Change a picture’s color saturation, add a few shades or change the focus area and you will see that the photo has improved dramatically. Don’t worry, it’s really easy! You don’t have to master Photoshop or GIMP and spend hours working on a photo. Pho.to knows some trusted post-processing techniques, so this site will help you improve your photos significantly in a single click. We have selected 6 different effects, and each one of them can change your photos in its own unique way. However, the common traits of these techniques are their high quality and versatility. Find out about all the effects!